If your dog is scratching a lot, and there is hair loss, flaking skin, and a musty smell, the cause could be an overactive yeast infection. My experience is common. I went to the vet and paid out for testing but nothing helped, and my dog just became more and more unhappy. The scratching and licking woke us up at night, and the her skin became raw, sore, and irritated. The itchy skin patches became flaky, and as the flakes came loose, it took small chunks of hair with it. 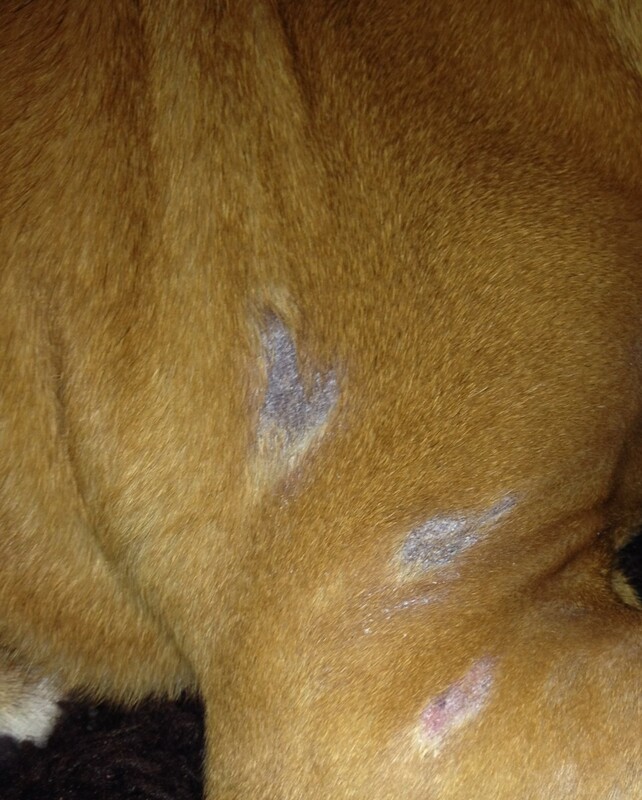 These areas grew in size, so the bald patches were very visible. In some cases, the skin underneath became dark, folded, and thickened — with an appearance almost like that of elephant skin. As I discovered, these were all classic signs of yeast infection. 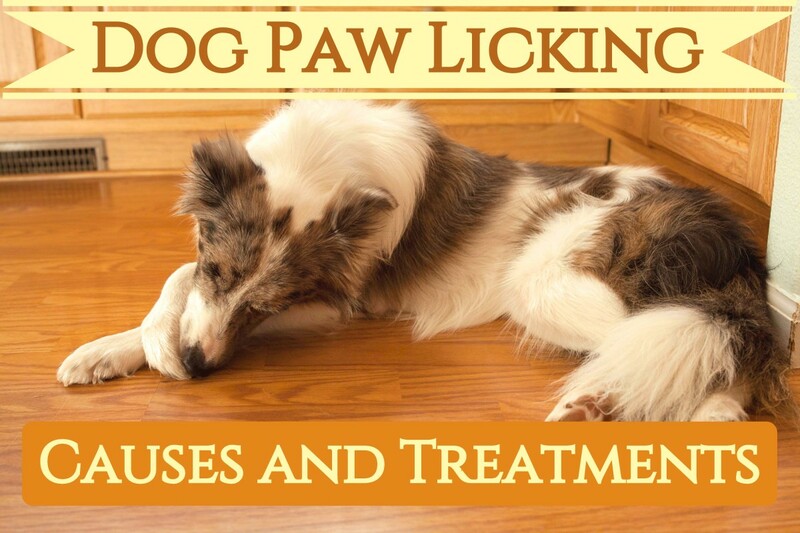 When I researched ways to help my dog stop scratching, I discovered a great number of remedies. I have to say, I have absolutely no vet training at all. This is just what I found from research and what worked for me. I hope it helps you, too. Yeast fungus naturally grows on dog (and human) skin, and is fine under normal conditions. But certain conditions will cause the fungus to multiply out of control and create health problems. With the above information in mind, I thought I’d check the labels on my dog’s food. I used to feed her dog food pouches and a dried food mix, along with a selection of biscuits for treats. I was alarmed to learn that most of her diet was made up of wheat! When I added together all the cereals, fillers, and wheat that I fed her each day compared to protein, I felt terrible. Dogs are meant to have a meat-heavy diet, and I was not providing it. I began to improve my dog's life by changing her diet to being wheat-free and more protein-based. I did this by cooking brown rice and chicken thighs with cheap chunks of beef. Her treats were pigs' ears, salmon skin, and meat leftovers from our food, which were cut into small pieces and carefully stored in the fridge. I also gave her a few dollops of sugar-free, probiotic yogurt every morning when her tummy was still empty. I have to admit, cooking her dinner took dedication. I usually cook three days' worth at a time and put it all in the fridge in plastic containers. I now have a routine and find it easy to do. My dog is delighted with her new food and eats it quickly even though it's the same meal every day. I also add in a dog vitamin supplement for a good immune system. 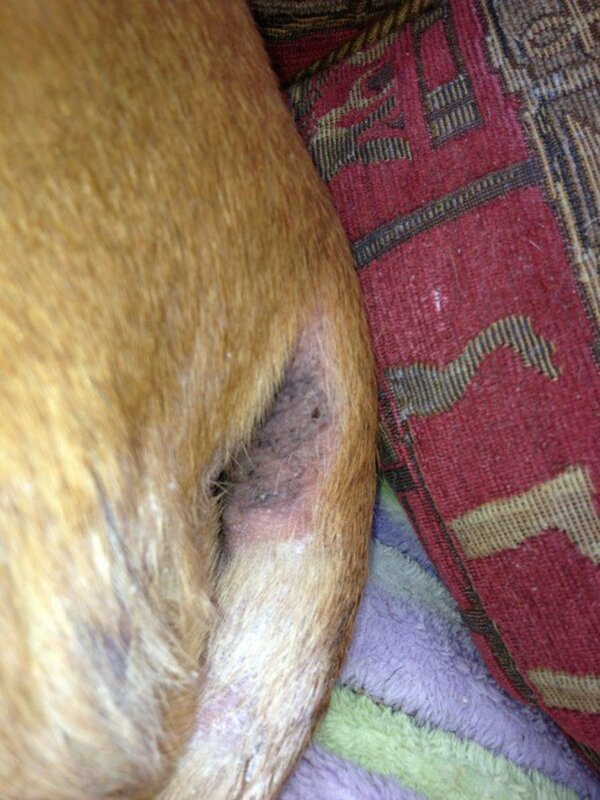 My dog's sore skin around her bottom. 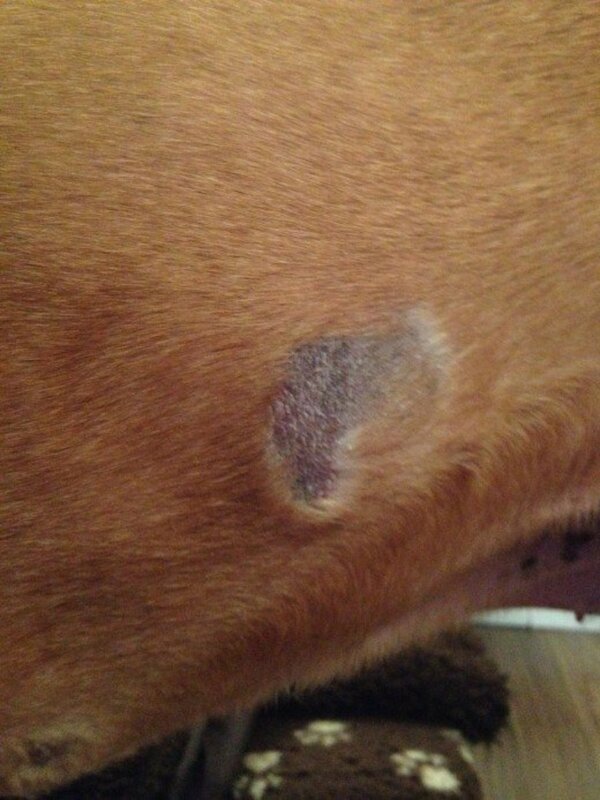 Bald patches on my dog. Check your packets, tins, and pouches to see what wheat and cereal you are feeding your pet. Too much wheat can lead to yeast infections. I bathed my dog in a fungal treatment shampoo. 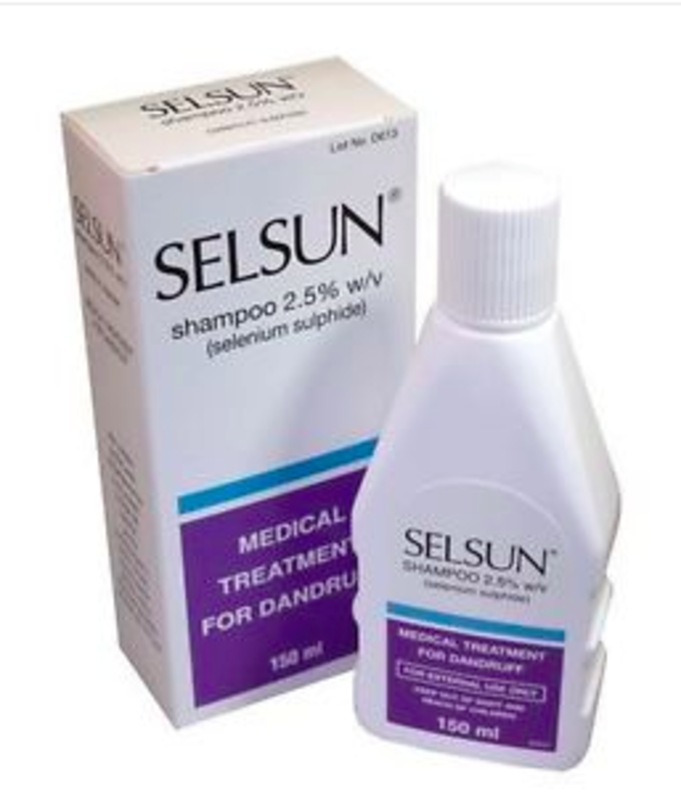 I used Selsun, which is available over-the-counter in many stores. In the USA, it is called Selsun Blue and is available everywhere. In the UK, you have to go to a more old-fashioned kind of chemist — like Lloyds — and ask for it, as it's not always on the shelves (they have it in the back). It is a human shampoo, but it is made solely for the purpose of reducing fungal overgrowth and is often recommended by vets for animals. I have to admit it smells a bit strong, but it does the job well. In the UK it isn't 'blue'. It is available in-store at Lloyds Chemists, but you might have to ask for it, as it is sometimes behind the counter. At first, I bathed her every day. She was so happy with the reduced itchiness that her depression was lifted immediately. A lot of her hair came off at first, so she looked worse initially. I was really concerned that I wasn't doing the right thing, but it proved to be okay in the long run. Her hair loss stopped after about 5 days. I covered her really sore patches in Sudocrem, which is a diaper cream. This is commonly used on babies, but I used it on my dog, and it gave her instant relief. The tub says that it contains antiseptic and healing qualities. It is very thick and sticky, so it stays put very well. This cream does include zinc oxide, which is used to treat mild diaper rash with a yeast infection. Some people are concerned that zinc oxide is poisonous for dogs, but my research has indicated that this is only true if a large amount is ingested. To ensure that your dog does not eat it, make sure to store the tub away from them and stop any licking of the treated area as much as possible. At a different time of the day, I also rubbed pure aloe vera mixed with a few drops of tea tree oil onto the less raw spots to help them heal. I also read that some people dab their dogs with apple cider vinegar diluted to 50 percent, which stops itching and kills the yeast. None of these ingredients are very expensive. You can try all of them in a day or just select the ones that work for you and your pet. Make sure you dilute them so you don't cause discomfort to your dog. Since I began treating my dog, I have also discovered Neem Oil. It is used a lot in Indian culture to cure many ailments. This stuff really eases extremely sore skin and seems to rapidly heal the skin as well. It must be diluted with a carrier oil, such as olive oil or almond oil. It smells quite strong, but my dog does not mind it at all. The main thing is to be consistent and to keep going. Even when you see improvements, you must keep the treatment up. Unfortunately, this process takes a while, so you must be patient. I have discovered that there is a range of fish skin snacks and treats that are really good for your pet dog. Mine goes crazy for them. They have no added ingredients and no cereal, gluten, colouring, or wheat. They do contain omega 3, fish oils, and trace minerals, which have a lot of health benefits. They don't really have too much of a smell either and, so far, my dog has not left any mess on the rug with these. They come in bone-shaped treats and strips. My pooch will wolf down any of them! They are not too expensive, but they do seem to be a little hard to acquire. I purchase mine on Amazon. I have to confess, after my first success with keeping yeast under control, I let things slide for a while. I started using dog biscuits for treats and used normal dog shampoo, which made the itching return after a few months. I am now stricter with her diet. Unfortunately, she will steal food she isn't allowed to have. If anyone leaves a sandwich, packet of biscuits, or piece of cake unattended for a moment, she will take it quick as a flash. More than once, she has taken a whole loaf of bread off the kitchen table and devoured it before anyone could stop her. She might then suffer a flare-up on her skin that we have to treat, but it is never as bad as it was because she is no longer consuming wheat and fillers on a daily basis. Can coconut oil help with my dog's yeast infection? Yes, coconut oil can help with your dog's yeast infection but pets really like the taste and will lick it off. Will my dog's hair grow back? Yes, the hair will grow back on the patches, but it does take quite a long time. The skin has to heal first, and then the hair grows in. Some of the patches will have slightly different colors of hair when it grows back; it's a minor change. My girl has long fur. This has been making it difficult to get to her skin properly. Also, it keeps her super warm. Would it be okay to take her coat down a bit for treatment? I only have experience with my own short-haired dog, but I should imagine that cutting fur shorter will not do any damage as long as it is done safely. Savannah - thank you for your feedback. It is amazing just how much wheat is in dog food, isn't it! I hope everything now improves for Maverick - but remember that the progress is slow so keep it up. Hi! Thank you so much for yur help! I was so worried that my dig, Maverick, got into a fight with another fog, even though he isnt a violent dog and he us super sweet. Thanks to this article, we just found that his food has a bunch of wheat and yeast in it, as did his treats. 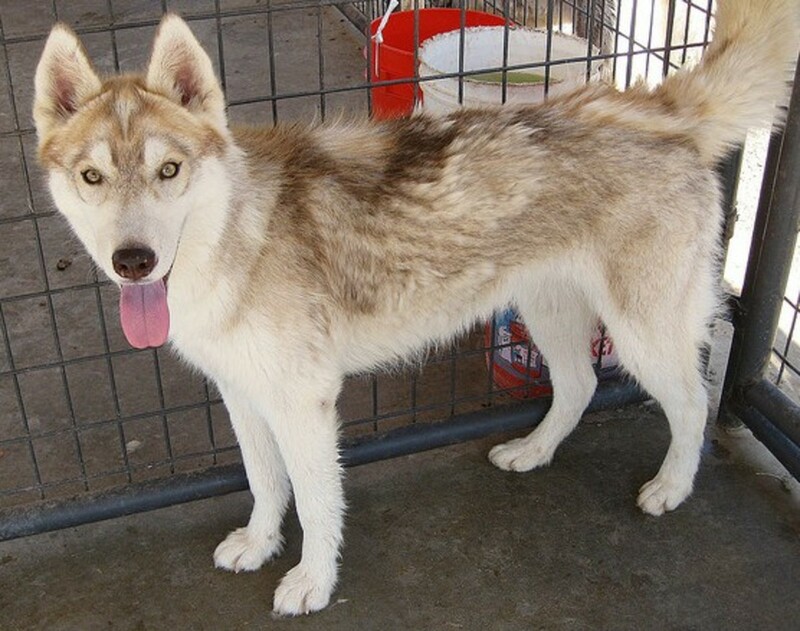 We are going to buy him new food and treats, and we will get him a new shampoo and conditioner as well. I am going to start rubbing aloe vera on the spot where he has no hair once every day. I recommend that everyone, check the ingredients in your dogs food and treats BEFORE you buy it and watch out for yeast and wheat. Thank you so much!! Hi..My pup have same infection .. Now Im giving 3 times milk and In noon white Rice with Yogurt... Is it Ok ?? Or i need to change diet of him??? Info. Coconut oil calms the itching.. I applaud you over an over for your consistency and OBVIOUS Devotion to your dogs well being! And thanks so much for this read! That’s SO MUCH my Biggest problem. NOT being consistent. After a few days it’s back to the same. I’m taking a guess here also that Sudocrem is something like “Bordeaux ButtePaste” for baby diaper rash. Nice name right? 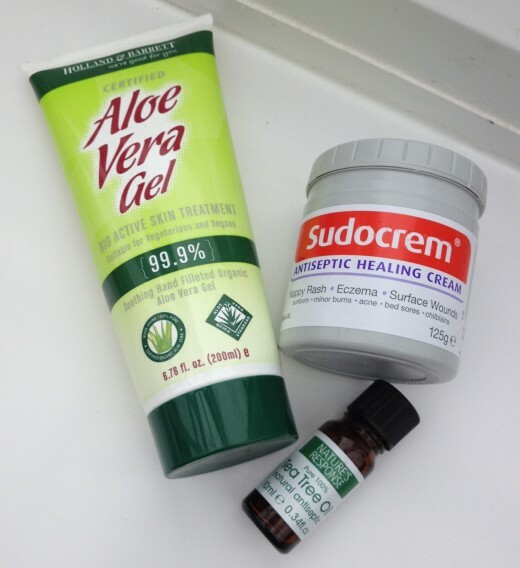 But great for all the same things Sudocrem is great for. Thanks again! All the best to your family,meaning your 2 legged and 4 legged ! My shar pei has a yeast infection but he is a very strong dog and wont let me bath him. Is there any medication that i could apply topically? 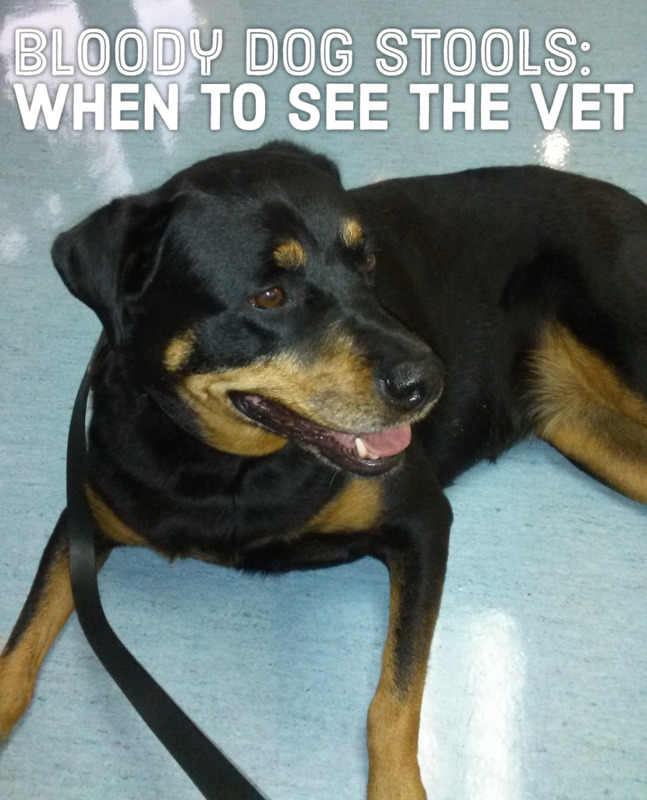 I am not a vet, I have only written about my own experiences with my dog. It is always difficult to know when they really need to go to a vet. Watch him closely, and make sure you take him if he starts to get really distressed, or sick or doesn't jump up happily at everyone. If he isn't itching or licking then it probably isn't the same condition I have written about, I'm afraid. I wish you well. My diablo is seven years old. He is playful. He jump and licks every one. He doesn't scratch. He doesn't lick. Yet he has a patch of halt missing. I can't afford a vet right now to missing a month of work due to my own illness. I have pictures but no t sure how to show them here. We had Issue with food allergy. Changes food. Very helpful, I am going to give this a try, heres hoping this will help my poor doggie. Her outbreaks are in the tail and rump area, very much as the photo shows. Hello Ashley, You have to find what is right for your own pet, I think. There are those who feel veg are important and many that feel dogs do not need them as they are carnivores. My dog was in a mess for quite a while, it took time and trials to get her in fine health, and now her fur is full, she does not smell awful, she is calm and her stomach regulated, so I will stick to not feeding her vegetables. But they are not harmful at all if anyone prefers to use them. 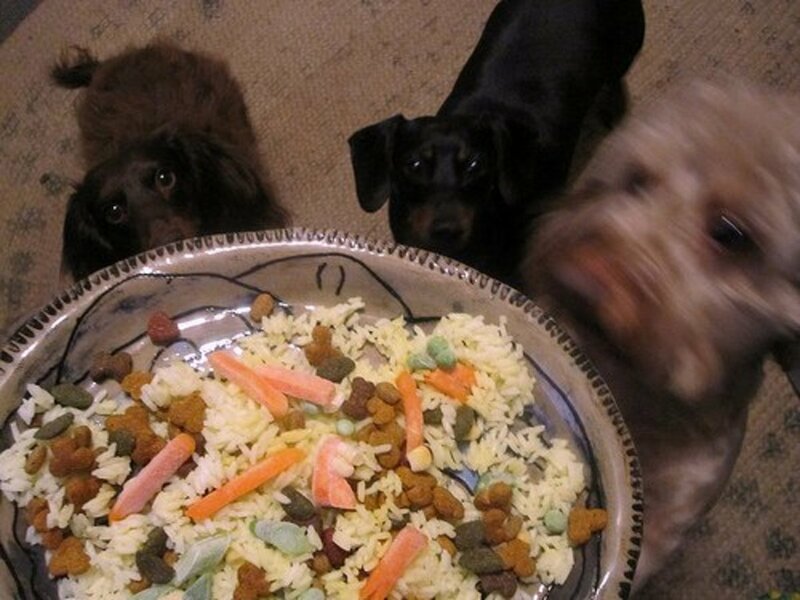 Veggies are great for dogs and they NEED them in their diet, otherwise they don't get the vitamins they need. I suggest adding peas, sweet potato, or pumpkin to your dog's food. I guarantee she'll gobble it up. Doc, I'm glad to hear there is some improvement, but if your young dog is sleeping a lot, that doesn't sound good. I would reduce the vinegar to one a week and then reduce it further now it is under control. Maybe the vinegar is making her feel unwell? Check your dog's diet as well, maybe a supplement is needed? but don't leave her lerthagic too long without seeking some professional help. I wish you luck. Thank you Marlo - I read that dogs can't digest fruit and veggies well, but I don't think it does them any harm at all, lots of manufactured dog food has carrots and peas in them I know. I understand that grapes and onions are particularly bad for them however. Glad to hear your two little dogs are fine and healthy. You're a great doggy parent for sure! Rated 'Interesting'. Thanks for the apple cider vinegar tips. I politely disagree with you about vegetables as my two small dogs eat carrots and brocoli, and do fine! Poor doggy. That looks very uncomfortable! Many dogs (and cats) do have food allergies, and you're smart to consider diet. Thanks Peggy W - We knew the problems had to be some kind of allergy or reaction to something, it just took a while to understand what it was. I hope you find something to help Skippy each spring time, too. 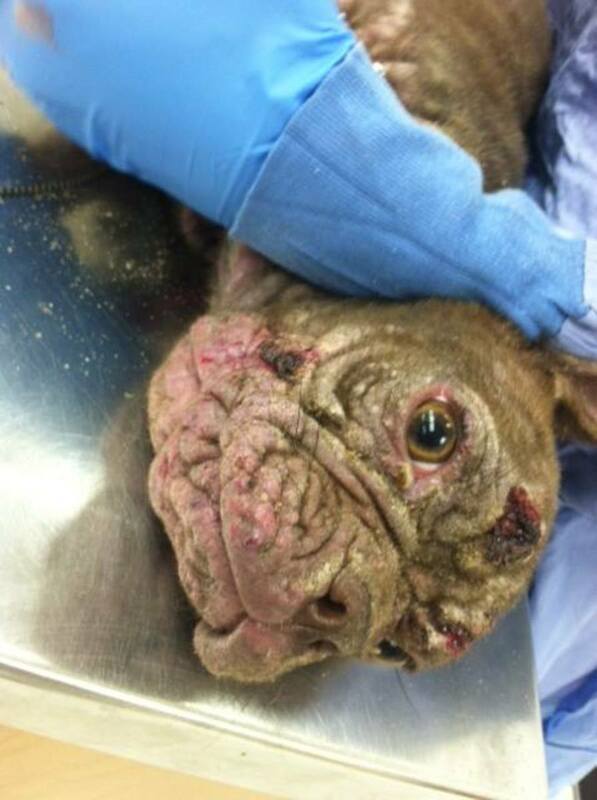 It is wonderful that you have gotten your dog's raw and itchy skin condition under control using your methods. We don't like to see our pets suffer. Our Skippy seems to scratch more every Spring and it seems to be allergy related. I already make homemade dog food for him. Fortunately his skin is not raw and irritated looking. Might try bathing him more often. Thanks for letting us know what you do to help your dog.